Packing; a near impossible task. So I’m just curious, is the task of packing stressful for most girls or is it just another fun little activity where I differ from the rest of the world? Because of all the things that need to be done in life, packing would have to be my least favourite, of all time. In all honestly, if there was one job in this world where I could snap my fingers and have it magically done for me, it would definately be packing. I’m not really quite sure what it is about it that drives me so insane but I just can’t stand it. Even just the thought of having to pack for something is enough to make me want to scream. Which is slightly ridiculous considering the act of packing normally leads to some kind of beautiful holiday. However in this case, even that is not enough to ease the frustration. Surely you would think that packing a single bag for a few nights away with your family wouldn’t be a difficult task. Think again my friend, because that couldn’t be further from the truth. For me, the task is not only never ending but it is near impossible. After pulling almost every piece of clothing I own out of my wardrobe, every single time I attempt to pack, I have come to the conclusion that packing could in fact become a little easier if I only had less clothes in my wardrobe. Logically, less clothes means less choices, which in turn means less frustration. Realistically though, what girl in her right mind is going to halve the size of her wardrobe, just because she is terrible at packing? The answer should be me, but the fact that it’s not is clearly the reason I continue to struggle. I’m sure there would have to be an easier way than my current strategy and yet still, I continue to put myself in the same situation, over and over again. My strategic plan; pack everything that I may feel like wearing at some stage during the holiday, regardless of how many days we are actually holiday-ing for. Whether it’s 2 days or 7 days, when it boils down to it, it really just depends on what clothes I like best in my wardrobe at the time. Jumpsuits over shorts, maxi dresses over skirts, tights over jeans. It all depends on the day really. Wel,l the day and of course the mood. Oh, and let’s not forget the weather. Every time without fail, the weather always finds his own little way to throw me. Perfect days filled with sunshine all week leading up to the trip, then sure enough, the day I am due to pack I wake up to the sound of the pouring rain, and just like that the frustration begins. As if my task wasn’t already hard enough, now I have to pack summer clothes and winter clothes because the odds have since changed. Now it’s just as likely to be cold as it is hot, which means the number of clothes needing to be packed has just doubled within seconds. So that my friends, that is the reason you will always see me with a bag triple the size it needs to be, because really, at the end of the day I just can’t quite make a decision. Not even about packing a few clothes. As much as I would like to tell you otherwise, the poor decision making t doesn’t quite stop there. The second a bag is packed and zipped, I’m already second guessing what’s in there. Did I pack everything I needed? Should I take a few things out? Did I really need to pack that extra jumper? Maybe I should put in an extra pair of shorts instead? What if I don’t feel like wearing any of that, did I pack a maxi dress? Do you think I could try and fit it into a smaller bag? Shoes, did I really pack enough shoes? What if everyone laughs at my giant bag? The list is honestly endless and my clever little brain finds itself going over every single possibility and every single wardrobe option, atleast twice an hour. 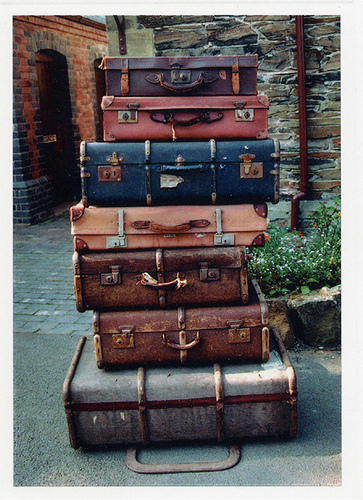 In fact, it’s so bad that even right up until the time we leave, I’m still second guessing myself – about packing. Most days, even with a suitcase packed to the brim I still manage to wander around and pack my handbag full of bits and pieces that I’ve forgotten. Bits and pieces that really don’t need to be packed mind you, but that end up coming along for the ride anyway. Then when we finally get there, just like Murhpy’s Law, I either end up wearing the same few pieces of clothing over and over or out of the million and one different outfits I’ve packed, I’ll still have absolutely nothing I want to wear. So either way, I’ve basically spent an entire day of packing, stressing and planning outfits for no reason at all. To tell you the truth though, it’s always been a disaster really. I mean sure, it’s quite a talent having the ability to pack an entire wardrobe into a single suitcase, every single time I travel, but it’s still a talented disaster nonetheless. I’m just hoping that come April I might have grown out of this so called ‘talent’ of mine, because there’s no way I’ll be able to afford the excess luggage fee for Vegas with my current packing strategies.